Healthy recipes and tips for folks with Type 2 Diabetes and others who love good, low carb food! Follow Type2delicious.com for all the newest recipes and tips! 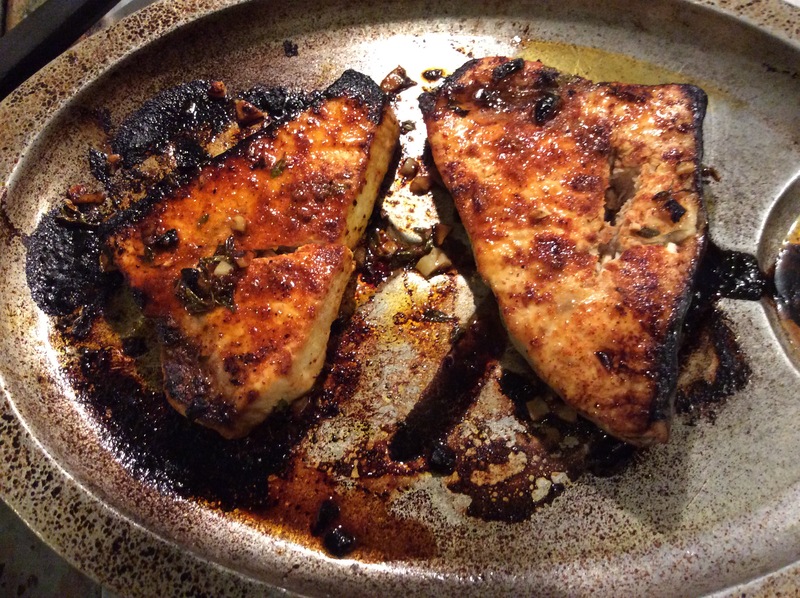 Fish is great for lots of reasons and Swordfish is one of my favorites; low calories/low cholesterol, healthy for you, plus overall deliciousness. We try to eat fish at least once a week, sometimes more often. If available, I look for fresh, line -caught varieties, or line-caught frozen fish; just as nutritious. See * below for more information about healthy fish choices. (Trader Joe’s is a good source of many frozen fish varieties, and Costco often has fresh.) Our local farmer’s market as well as other local markets offer fresh line-caught fish depending on the season– yes, a California coastal option, not everywhere. Barbecuing fish in warm weather is a great option and actually very easy. While the grill is hot and there’s room, we like to add sliced fresh vegetables such zucchini, onions, eggplant, red pepper ( I’m not a fan of green peppers- but if you are add them too). You can also broil the fish for equally great results. We’ve done it both ways and both are delicious! Starting with a tangy marinade gives great flavor. The one I’m giving you has lots of citrus, garlic and a touch of heat. We love it- hope you do too! 2. In a Pyrex glass or Corningware pan (I used Pyrex 9×13 size) lay steaks on a single layer on a thin layer of olive oil ( approx. 1Tbsp.). 3. Mix/wisk together marinade ingredients; olive oil, mustard, white wine, lemon/rind and herbs/seasonings. 4. 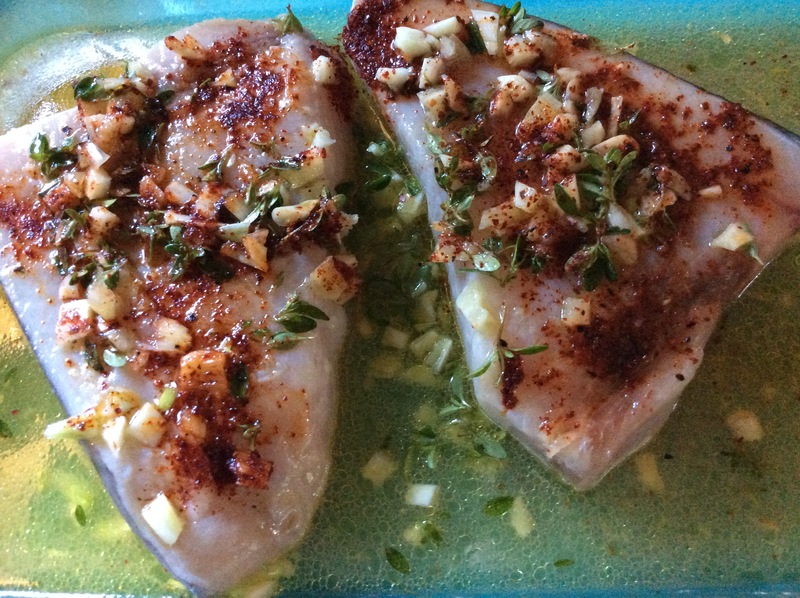 Pour marinade over fish. 5. Let fish marinate approx. 1/2-1 hr. 6. Barbecue 10-15 minutes depending on thickness of fish; (we like our fish moist and just a tad underdone- cook yours how you like it). 7. Sprinkle fresh herbs and dust with paprika. Please share this post with others who also love good, healthy food! 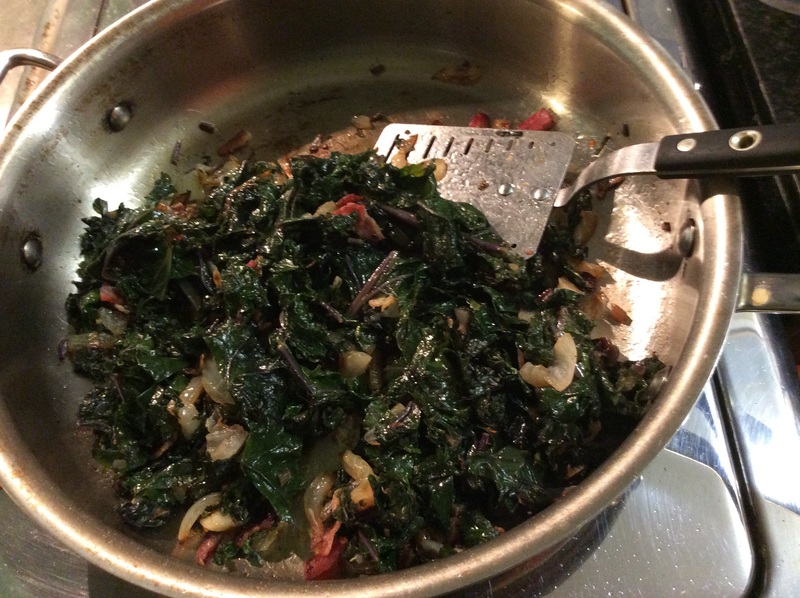 This recipe goes great with our sauteed spicy pumpkin and kale with bacon. After our holidays with a surfeit of rich, heavy food; (ok–delicious, and still basically low carb), including a traditional roast turkey, leg of lamb, and of course lots of vegetable sides, plus oysters Rockefeller, as well as raw, we’re ready for some lighter fare, especially fish. 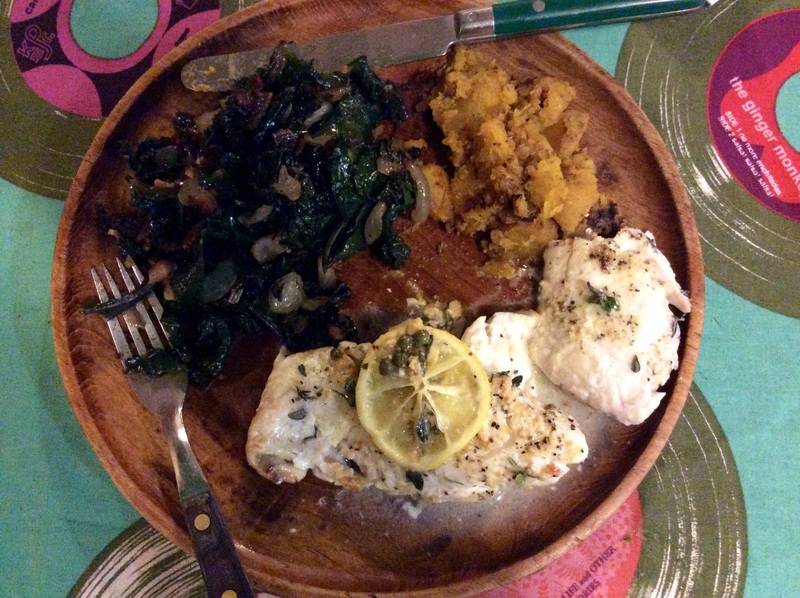 Baked Halibut in a lemon/mustard/caper sauce combined with kale sautéed with bacon and onion and sautéed pre-baked sugar pie pumpkin makes a scrumptious low carb meal. In this post I’ll give you the halibut recipe. 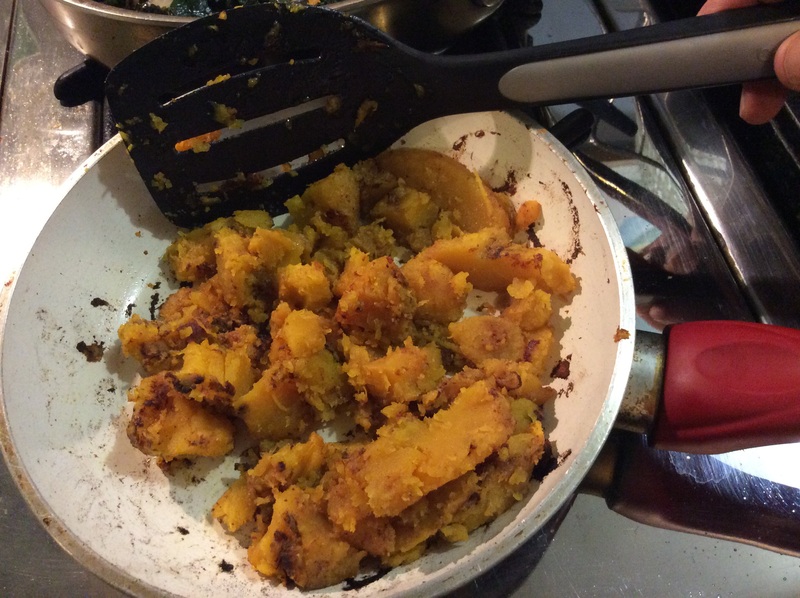 In subsequent posts I’ll share the other recipes we enjoyed for this dinner. Please follow my blog to make sure you get them too! 1. preheat oven to 400. 2. 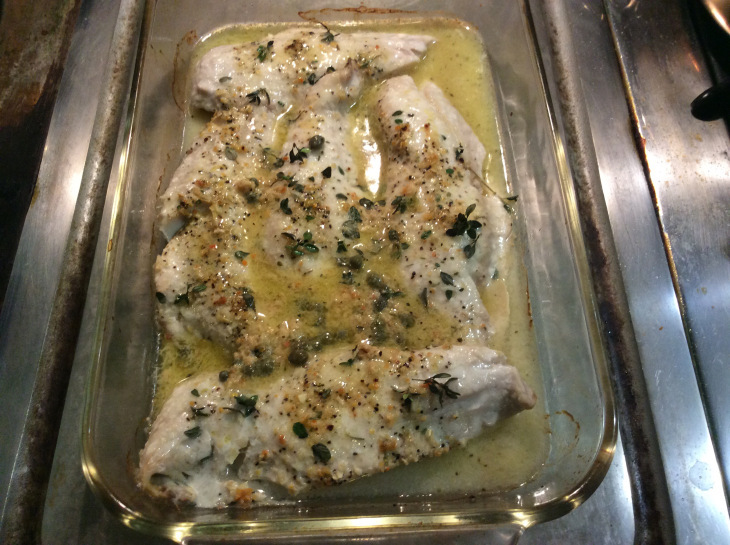 In a Pyrex glass or Corningware pan (I used Pyrex 9×13 size) lay halibut fillets or steaks on a single layer on a thin layer of olive oil ( approx. 1Tbsp.). 3. Mix/wisk together remaining olive oil, mustard, white wine, lemon/rind and seasonings. 4. Spread sauce over fish. 5. Sprinkle 1/2 of the capers on top. 6. Bake 10-15 minutes depending on thickness of fish;(we like our fish moist and just a tad underdone- cook yours how you like it). 7. Sprinkle remaing capers and dust with paprika. Serve with sautéed kale, pumpkin, and, as we usually have, a crisp green salad with a tart, lemony vinaigrette. Serve with sautéed kale, pumpkin, (recipes to come), and, as we usually have, a crisp green salad with a tart, lemony vinaigrette.